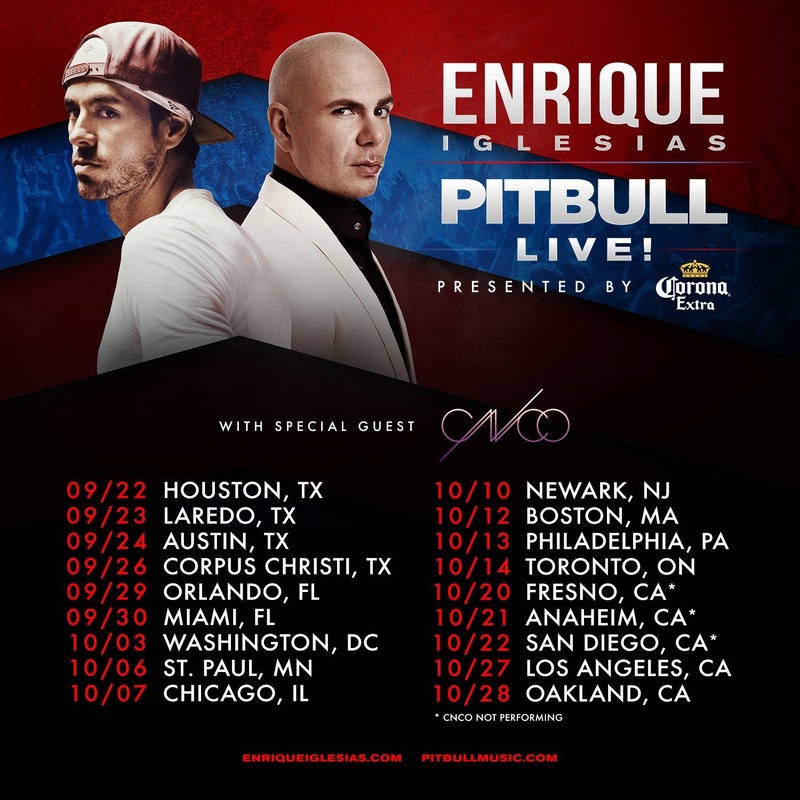 Pitque has added a second leg of tour dates to their Enrique Iglesias and Pitbull Live! Tour with special guest CNCO. 7/5 UPDATE: The Montreal and Toronto shows on the first leg have been postponed to October, making them part of the second leg. 9/15: UPDATE: The six shows in Florida and Texas have been postponed from September to mid-November. Coming after the first leg in June & July, the dynamic duo will hit 18 North American cities this September & October. The new leg kicks off September 22 in Houston, TX and rounds out October 28 in Oakland, CA. The additional run will include repeat dates in Houston, Chicago, & Miami and new dates in Boston, Washington DC, & Newark. Tickets will be available via pre-sale next Tuesday, April 25 at 10 a.m. (pre-sale codes: climate & ei2017) and the general public will be able to purchase tickets starting Friday, April 28 at 10 a.m. Purchase your tickets at TicketMaster and your VIP packages via VIPNation. *All dates, cities and venues above are subject to change. In addition to the second run being announced, a double show at Madison Square Garden in New York on July 1st has been added to the first leg of the tour. To see the full list of first leg tour dates and info, click here. Check back here for any news/updates on the #EnriquePitbullTour/#PitbullEnriqueTour. Looks like I will be going to see his second show in Toronto!!! I’m so excited.